Historical map of the Yucatan and Guatemala published in Amsterdam by Arnold Montanus, 1671. In 2012, CRL libraries voted to acquire the complete set of the Archivo General de Centroamérica, 1544–1821 (also known as the “Central American Archives”). This acquisition, approved through CRL’s Purchase Proposal Program, makes accessible more than six million pages of original primary source documents chronicling Spanish rule in Central America and parts of Mexico. 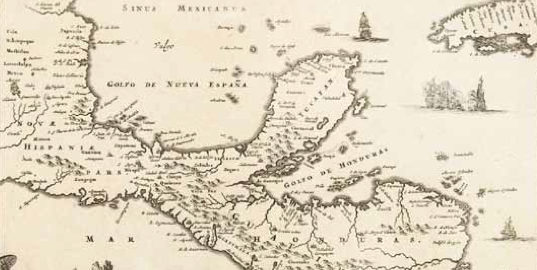 The Central American Archives collection represents a vast and unique resource for scholars of colonial and post-colonial history in Central America. The collection originates from the Archivo General de Centro América (AGCA), located in Guatemala City, Guatemala. As the designated repository for colonial, municipal, provincial, and other records for the Captaincy General of Guatemala (Capitanía General de Guatemala) and related bodies, the AGCA holds the most comprehensive record on colonial affairs of the region now encompassed by Guatemala, El Salvador, Honduras, Nicaragua, Costa Rica, and the Yucatan and Chiapas regions of Mexico. “The Archivo General de Centroamérica is the richest collection we have for Guatemalan colonial history,” notes Dr. Laura Matthew, colonial historian in the Department of History at Marquette University. Her recently published book, Memories of Conquest: Becoming Mexicano in Colonial Guatemala (The University of North Carolina Press, 2012) relies heavily on records found in the AGCA and other collections to demonstrate how indigenous allies helped the Spanish gain a foothold in the Americas. Dr. Matthew’s work explores the colonial past of Mesoamerica, tracing the relationship between the Spanish conquistadores and the Nahua, Zapotec, Mixtec, and other groups that made European conquest possible. From 1524 to 1528, thousands of indigenous allies from central Mexico and Oaxaca invaded Central America alongside a few hundred Spaniards, planning conquests, raising troops and supplies, and instigating alliances. Matthew sheds light on the motivations of the “yndios conquistadores” by exploring the broader context of history of warfare and imperialism in Mesoamerica that extends well before the narrative of European expansion. These warriors often remained behind as colonists, enjoying privileges due to their identity as conquistadors. In Ciudad Vieja, where Matthew bases her research, the descendants of the indigenous colonists became known as “Mexicanos,” subject to the colonial dictates of Spain but distinct from the conquered Mayan population by language (Nahuatl) and societal position. Matthew characterizes this group as an “inbetween” population, both indigenous and foreign, Indians and conquistadors. The Mexicanos were able to carve out a distinctive place within Guatemalan society by embracing the colonial order, where many Mesoamericans resisted integration into the Spanish Empire. Matthew began her work in the archives, as most scholars do, by consulting the old-fashioned card catalog that takes up a large section of the second floor. The “Catálogo Pardo”—named for the former director that undertook the organization of the archive—consists of 23 cabinets, organized roughly by theme and subtheme. Scholars pull file drawers one by one to peruse the million-plus card files, each containing some basic classification and content description. Documents are identified by the number of the bundle—or legajo—then by expediente, or individual document number. The six million pages of documentation include a wide range of content, from official dispatches, confidential letters, and edicts of the central government to petitions, personal information, probate records, and court records documenting the small details of everyday life. A significant portion of the collection traces economic affairs of the region, spanning the years 1519 to 1854. Records include information on excise taxes collected, land records, rents and property taxes, revenue accounts, agricultural and commercial affairs, and more. One large segment of the collection covers legal affairs, judicial writs, civil and criminal proceedings, hearings and trials, and civil and criminal sentences. Dr. John Browning, now Professor Emeritus of Spanish at McMaster University, also used the AGCA collection during his doctoral research on the late colonial period of Central America. Following a summer of research in Guatemala in 1968, Dr. Browning brought his experience with the impressive but endangered collection to the attention of William Ready, University Librarian at McMaster. To Brown’s delight, Ready suggested they approach the Archivo with a proposal for cooperative preservation of the collection. After obtaining funding from the Donner Canadian Foundation, McMaster and the AGCA (under the auspices of the Ministry of Culture of Guatemala) began the preservation effort that would ultimately encompass more than 144,000 documents on nearly 4,000 reels of 16mm microfilm. The task took nearly a decade to complete, under challenging conditions and with fragile and faded originals. The microfilm was transferred to McMaster, with the original documents and copies of the film remaining in Guatemala. For nearly 30 years, the microfilms were only available on site at McMaster’s Mills Memorial Library. In 2005, McMaster entered a collaborative agreement with ProQuest and the AGCA to distribute the film to other libraries. Given the variable quality of some of the film, ProQuest took pains to remaster the microfilm to improve the images and produce high-quality reproductions on 35mm microfilm. Only a limited number of institutions acquired copies due to the high price of purchasing the microfilm archives. Eventually, in 2011, rights for distribution of the collection posed to Norman Ross (Ross Publishing) in 2011. B1: documents of the National Period. The former director of the AGCA, Joaquín Pardo, undertook the systematic organization of the colonial material as part of his life’s work. The organization of the collection is idiosyncratic, with a unique classification system that orders the collection both by type of governmental document as well as by distinct themes, geographic location, chronology, and proper name. The existing finding aids to the collection (linked to CRL’s catalog record) provide pathways into the collection by geographic location, dates, and subject categories both in Spanish and English. However, the subject terminology employed is quite broad in many cases, classified at the legajo level and excluding the detailed descriptions of expedientes found in the original card catalog. Image courtesy of the Archivo General de Centroamerica. This challenge drew the interest of Russell Sheptak, Research Associate at the University of California, Berkeley. Sheptak, also a doctoral candidate at the Universitet Leiden, is a historical anthropologist interested in the colonial archaeology and history of Honduras. His initial research focused on pre-colonial populations in Honduras. Through examining early historical texts, he was able to establish place names of pre-Hispanic settlements, and conducted extensive archaeological research to identify evidence and characteristics of established societies. Sheptak became interested in the co-construction of colonial society in Spanish colonial Honduras. He was intrigued by how Indians and Spaniards, Afro-de-scendants, French, and Americans living abroad negotiated their place in colonial society. As time went on, the documentation of the AGCA factored increasingly into his research. In 2006, Berkeley acquired a complete set of the AGCA microfilm from ProQuest through a favorable pricing arrangement CRL organized for its members. Sheptak, then a visiting scholar at Berkeley, was among the first to use the collection and began sifting through the reels related to Honduras. As described above, he found that the finding aid created from the microfilm log lacked specificity. He also discovered that the guide contained errors in date transcription and, surprisingly, was missing more than 100 reels of content. Drawing from his extensive experience in the computer industry, he began creating a database that would fill in the gaps and enhance the basic records with additional information. Sheptak’s work on the database grew into a formal program at Berkeley under the auspices of the Undergraduate Research Apprentice Program, an opportunity for students to work with faculty on cutting-edge research. In collaboration with Rosemary Joyce, a professor in the Anthropology Department, Sheptak introduces students to the nature of archival research, the types of documentation available, and the processes for reading colonial handwriting. Students then begin collecting information from the documents on microfilm, recording title information, a brief description of the document, and names of people and places mentioned in the document. Of course, indexing a collection of 150,000 documents is painstakingly slow. Sheptak and colleagues began their work on the Honduran section of some 10,000 expedientes as a pilot, which, if successful, could be expanded to the entire collection. The objective is to create a searchable online database that can be used to pinpoint documents in the microfilm collection as well as the original document repository in Guatemala City. Sheptak hopes to start by mounting the basic information from the existing finding aid, and expand information as it becomes available. Teresa Chapa, librarian for Latin America, Iberia, Latina/o Studies at the University of North Carolina, also sees tremendous value in the archive. “There is a growing interest in Guatemala on campus. More and more, I am seeing requests from this kind of material from our students.” Chapa notes that professors teaching colonial history such as Kathryn Burns (Department of History) encourage students to engage with archival sources. For these reasons, Chapa sought support from her colleagues to nominate the Central American Archives for CRL’s Purchase Proposal Program.